The temperature can rise tremendously within a few minutes. “Comfortably warm” can rise to “dangerously hot” while you browse or wait in line in a store. 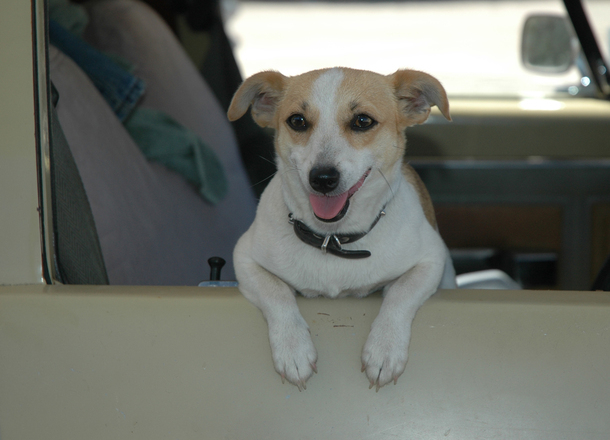 If you are hungry, consider drive-through or outdoor dining with shade where you can bring your pet. Think pet-friendly shops for your purchases. Or even let your pet have some extra time to relax at home where it’s cool while you run your errands. Hydration is key when the temperatures rise. Fresh, clean drinking water is a must. 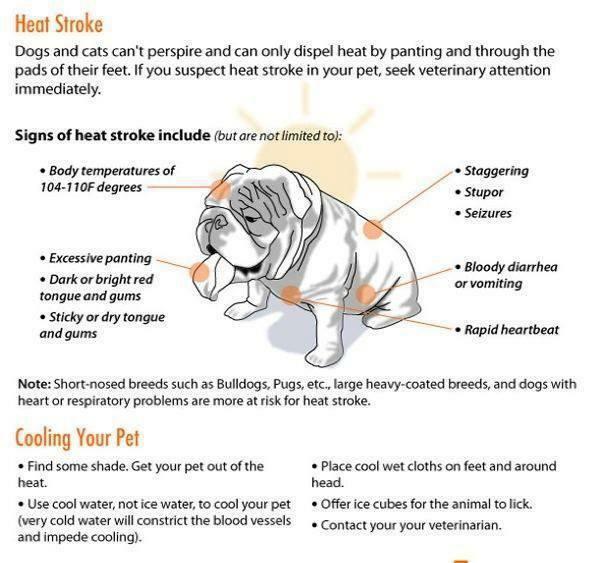 Dogs and cats do not sweat all over their bodies as we do. They primarily cool themselves by panting, which is less effective. 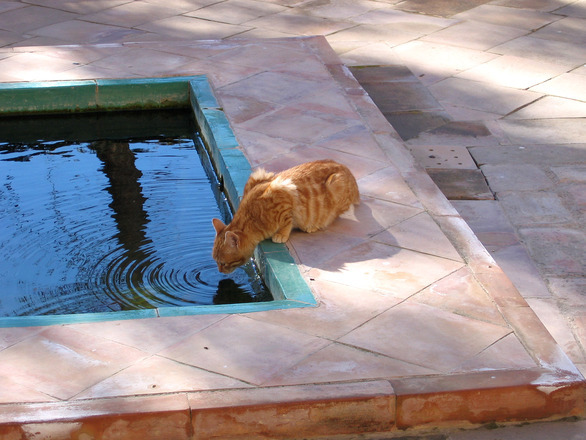 To cool a pet, you can wet their paws or even the belly using a wet cloth. Do NOT use freezing cold water, as this can cause the blood vessels to constrict, prolonging the heat. For a little extra fun with keeping cool, provide a kiddy pool for your dog to play in! Heat is not the only summertime threat. The warm weather is ideal for some nasty parasites, such as heartworm-carrying mosquitoes, fleas, ticks of all sorts, and intestinal parasites. All these nasty parasites can harm your pets, and some can even be fatal. 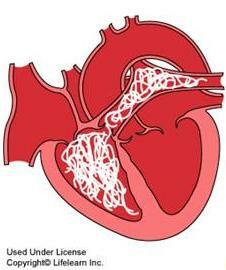 Some ticks carry Lyme Disease, and adult heartworms can be lethal. 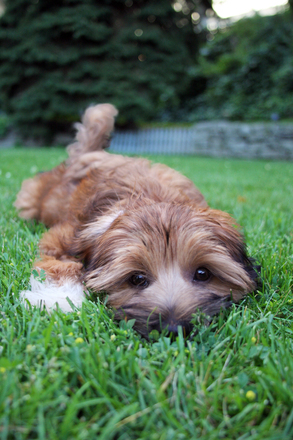 Some intestinal parasites are zoonotic, that is, they can be passed from pets to people. That’s right – your family members might become infected with worms if you do not provide parasite protection for your pet! Fortunately, there are products like Heartgard, Nexgard, Simparica and Advantix that provide protection. There aren’t any motor vehicle fluids you particularly want to give your pet, but coolant/antifreeze can be especially dangerous, since it tends to taste sweet. Dogs can be drawn to it.. It does not take much to cause symptoms or even be lethal to dogs and cats. You can be a little safer with a more pet-friendly coolant – these use less toxic chemicals and some have added bitter chemicals that make them less appealing to pets. Playing outside in the sunshine is one of the best features of summer. Exercise is essential to the health of your pet, but you will need to be smart about where you take your pet to play. Some grassy areas may be coated in dangerous pesticides or fertilizers that are toxic. Sometimes you really need to air out the house and get a fresh breeze. When you do, make sure any window screens are securely closed. One exciting moment of a bird or small rodent running by could send an indoor cat on an outdoor adventure they are not prepared for. 7. Bring Them to Winslow Animal Hospital for a Checkup! Dogs and cats age more quickly than people do. This means their bodies can go through more changes and develop diseases insidiously fast. A healthy adult dog or cat should be seen by a veterinarian for a physical exam about once a year. Senior pets (over the age of 7, on average) or those with health problems may need to be seen more often. Now is a good time to bring your pet to the vet! Fireworks can be anxiety-inducing for pets. 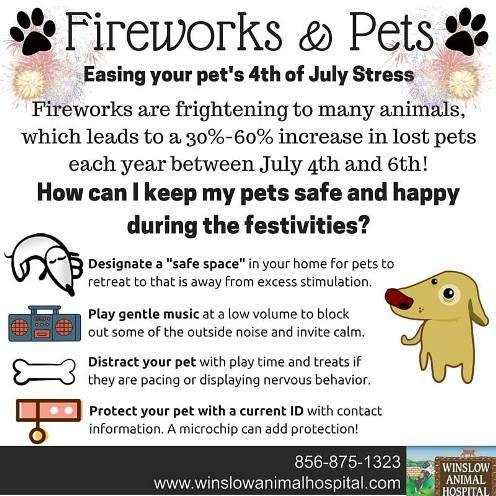 In preparing for the 4th of July, one technique you can use is to systematically desensitize your pet to the sound. Play audio/video of fireworks on your phone or computer at a low volume that is not frightening. Increase the volume only a little at a time and do so during fun time with your pet and provide praise and treats for behaviors you wish to see in your pet. Eventually, if all goes well, your pet will be accustomed to the sounds. Dogs can get sunburn, too. Breeds without as much protective fur, with very light fur and skin are particularly susceptible. Sun damage can even lead to skin cancers. One way to protect against the sun’s harmful ultraviolet rays is to use a sunscreen. 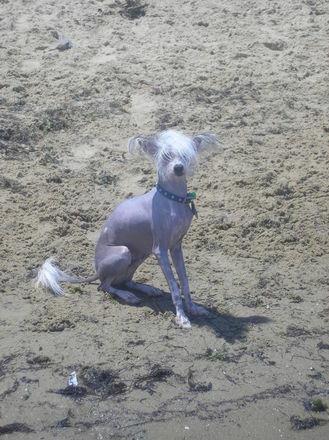 Ideally, find a sunscreen made especially for dogs. It is important to be careful when selecting a sunscreen, as some may lick at and ingest the sunscreen. Some may contain dangerous chemicals, such as PABA and zinc oxide. Click here to read more from PetMD about dog sunscreen. LifeLearn Admin | Pet Health, Tips, Top Ten, What's New at Winslow Animal Hospital! I like your advice to be careful where you take your pet to play because of the potentially toxic chemicals used to treat the lawn. It’s hard to know sometimes what will be harmful to your pet so it might be a good idea to have an animal hospital in mind in case something were to happen while out and about with your pet. Knowing that you have a safety precaution in case anything were to happen to the extra member of your family can do a lot in making sure you have the peace of mind you need in a potentially stressful situation. To celebrate moving into our new home, my fiance and I adopted a puppy named Boomer. Having this new addition in our family has prompted us to look into a veterinary hospital for him as well as any tips. We will be sure to not use fireworks near him or let him near fireworks in general. The dog days of summer always comes with its own set of potential stumbling blocks. Levelheadedness and precautionary measures can keep our four-legged family member safe from the sickness and disfigurements. As a pet owner, you have to keep your pet safe from the parasites like- fleas, ticks, you have to make sure that your pet is having a shelter from the sun, you should let the burrs get buried, you should give enough clean water to your pet, you must have a pet first aid kit, and lastly, you should consult a reputable veterinarian on regular basis, by which you can keep your both feline and furry companion safe from the adverse effect of the blazing heat of the summer.